Organic. Great taste 2014. A nutritious blend of 5 grains and 5 seeds. Scottish oats. Cooks in 3 minutes. Clean ingredients. No refined sugars. No artificial anythings. Non-GM. High fibre. No added sugar and salt. Wheat-free. Vegetarian Society approved. Kosher - KLBD.Once a perfect porridge met a blend of barley, rye and quinoa. They seemed made for each other, then they hooked up with some linseeds, sunflower and pumpkin seeds, and the whole thing became complex and delicious. The plot thickened and so did the porridge to a sublime creaminess with a hint of crunch for a perfect happy ending. The power of five Five seeds. Five grains. If our calculations are correct, that adds up to incredible to the power of tasty. 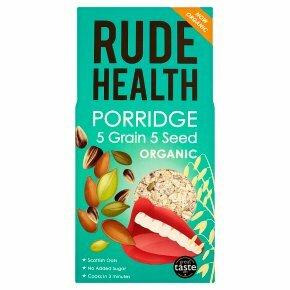 Each ingredient brings a different sensation: oats are smooth, barley is deep, rye is nutty, buckwheat is toasty and quinoa crackly. Linseeds are a bigger bite, sunflower seeds go crunch, pumpkin seeds go pop-splat and golden linseeds add pure goldenness. In a Pan: Bring to a boil and simmer for 3-4 minutes, stirring occasionally. Microwave: Pour ingredients into a bowl and cook on full power for 2 minutes then stir. Cook for a further minute, then stir. Leave to cool and thicken for 2 minutes.